The Webelo Scouts of Pack 107, All Saints’ Episcopal Day School, recently visited the Growing Together garden to tour the facilities, learn about composting, and plant a fall crop. Thanks to the leadership of Judy Walden, Volunteer Coordinator, the outing was a tremdeous success. The scouts, many for the first time, were able to turn a compost bed. While students today are educated on the benefits of conservation and recycling this simple task brought the scouts back to nature and allowed them to touch and feel the product of their work, developing a fuller understanding of the process of decomposition. 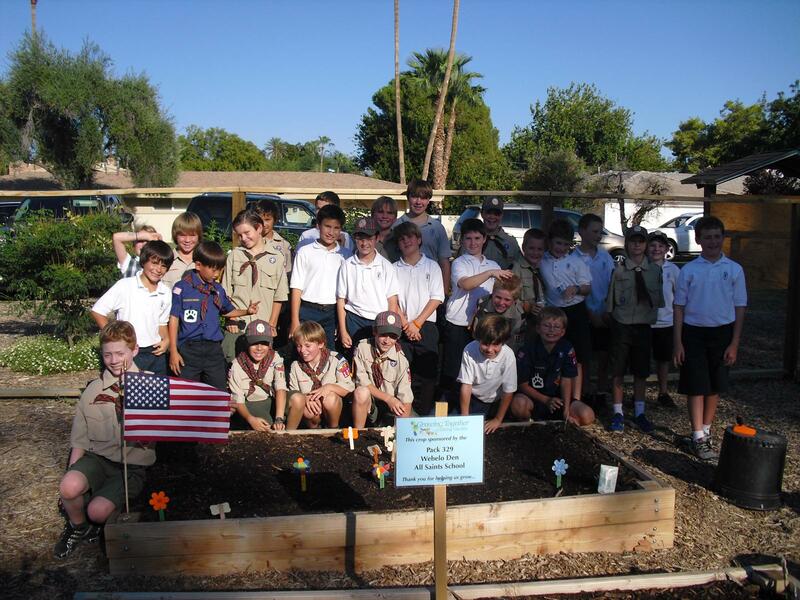 Similarly, the scouts were involved in planting seeds and creating seed markers. They all look forward to returning to the garden to help with with weeding, composting and watering and, of course, seeing their garden grow. Thank you to all the volunteers at Growing Together for allowing the Scouts of Pack 107 to be a part of your fall planting season.